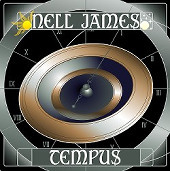 Tempus by Nell James is now available for digital streaming and purchase on Bandcamp. This is my first album. The material was composed throughout the year of 2005, and the recording was done in my bedroom "studio", mostly in early 2006, being completed at the end of March. It represents a major step forward from my previous work. Stylistically speaking, much of the music is rooted in my love for '70s epic symphonic rock.